One of the best things about Liverpool is the food. 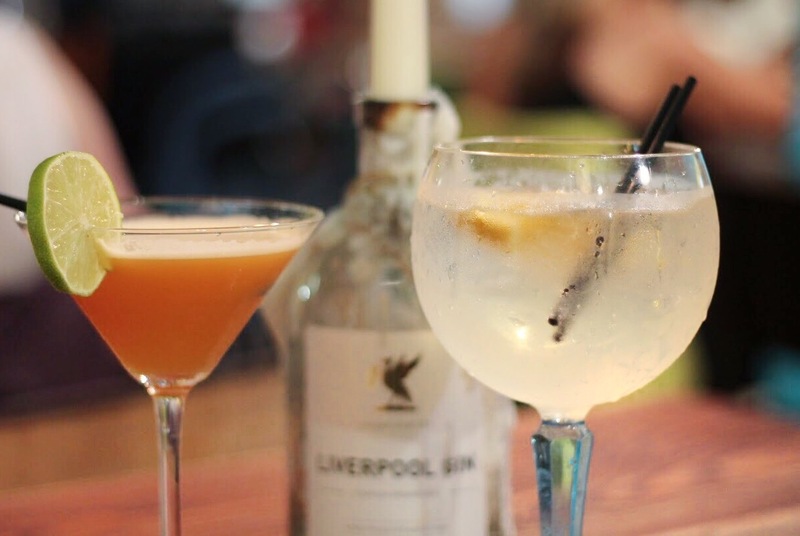 Over the past few years, Liverpool has flourished into a bit of a foodie city, and one of the restaurants I've been to a few times is the Baltic Social. As you might have guessed by the name, it's located in the Baltic Triangle, one of my favourite parts of town and one of the most Instagrammable places in Liverpool, and last week they launched their new menu. Me and Beth were kindly invited to try out the new stuff, so I thought I'd share our thoughts. In the past, I haven't always been a fan of the vegetarian options at the Baltic Social, but the new menu did not disappoint, with plenty of veggie and vegan dishes to try. It's very rare that I look at a menu and actually have several dishes to choose from. Being a vegetarian who despises halloumi, mushrooms, nuts, eggs and goats cheese, I'm not usually left with a lot of options. This time though, I actually had about three or four options to choose between - it's a miracle! I eventually settled on the mac'n'cheese with garlic bread, because why would I not pick the most delicious meal of all time? Ever since this night, I've been on a mac'n'cheese hype, thinking about it constantly, desperate to have it back in my life. Oh god I really want to go back for this mac'n'cheese.. It was the best I'd had in a long time. 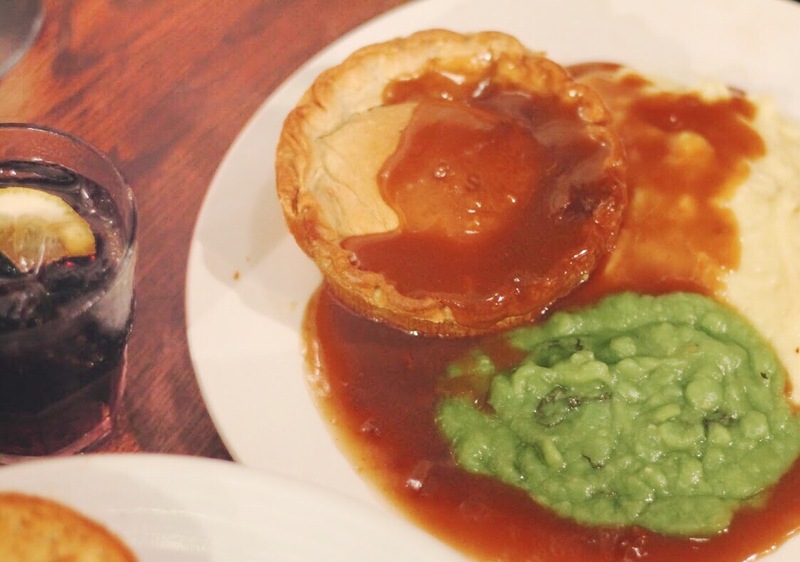 Beth tried the homebaked Scouse pie, mash and peas, which even to a veggie looked delicious. What a northern meal, I love it. It might not have been the wisest option considering the ridiculous heat but she says it was worth it. 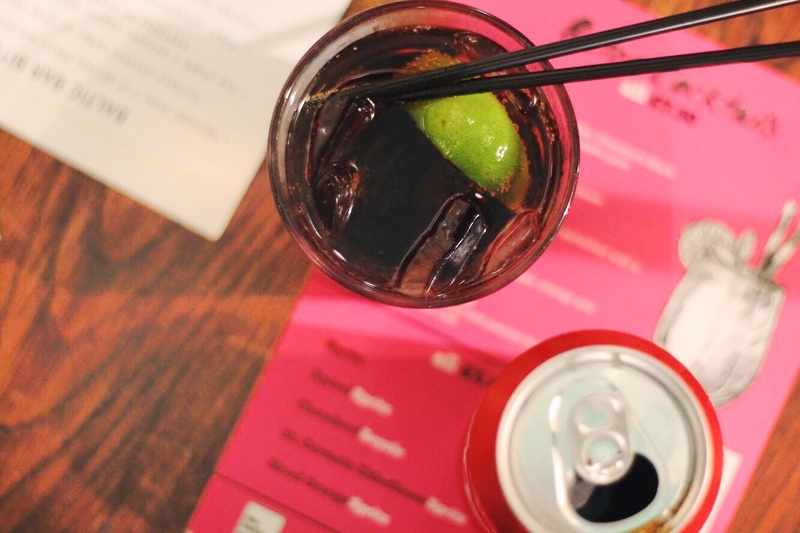 Lucky enough we got to cool off with some ice cream and drinks, straight off the new menu at the Baltic Social. Next time we head down to the Baltic Social, which is just around the corner from Liverpool's new Baltic Market, I'll be trying the Mexican pie with quinoa and avocado, sounds like a dream! That is if I don't go for that gorgeous mac'n'cheese again. I'm a sucker for a gimmick, so when I saw ice cream burger on the menu, of course this was what I was going to order. 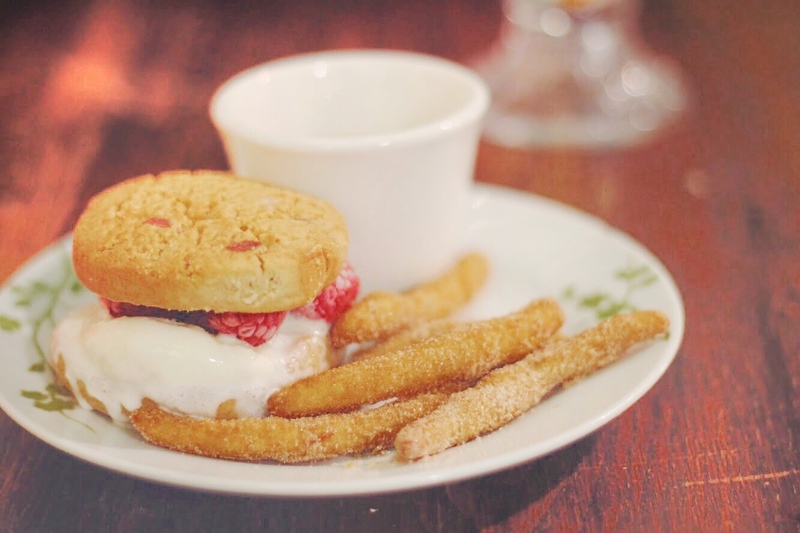 The burger is ice cream and raspberries, sandwiched between cookies with churros and chocolate sauce on the side - sounds amazing, but damn was it hard to eat. Granted, this is a minor problem, but the raspberries were frozen, and still pretty hard, which meant the churros were actually my favourite part of the dessert. I'm not sure I'd order this again, but the vegan lemon cake? I might be tempted. 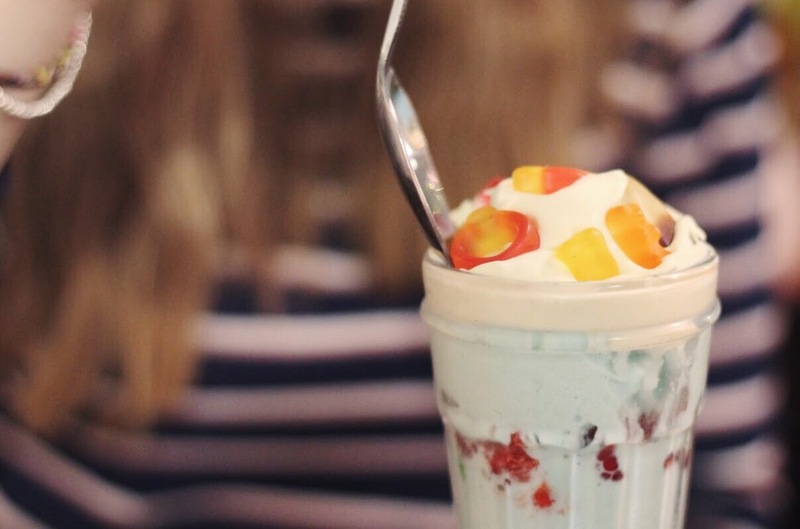 The same goes for the ice cream sundae Beth went for; mix of bubblegum ice cream, whipped cream, haribo and the odd surprise skittle and piece of popcorn. Despite nearly choking twice and being unable to scoop out the bottom of her sundae, overall it gets a thumbs up from Beth, who appears to have the biggest sweet tooth in the world. And I thought I was bad! To end our evening at the Baltic Social, we decided to have a tipple, mostly because we were far too full to even move from our seats. And yes we had to unbutton our jeans in public. We all do it guys, come on. Beth went for a pornstar martini (prinny behaviour) and after discovering my new found love for Aperol Spritz after their recent Liverpool event, I decided to try something similar, a blood orange spritz. I was pretty excited by this, but unfortunately my blood orange spritz was just a spritz. With a lot more blood orange, I'm sure I would have loved it, but next time I'll be trying one of the other cocktails from their new cocktail menu. Have you tried the new menu at Baltic Social yet? What did you think? *This meal was courtesy of the Baltic Social, but I have not been paid to write this post. All opinions are my own and completely honest. This food looks so so good! 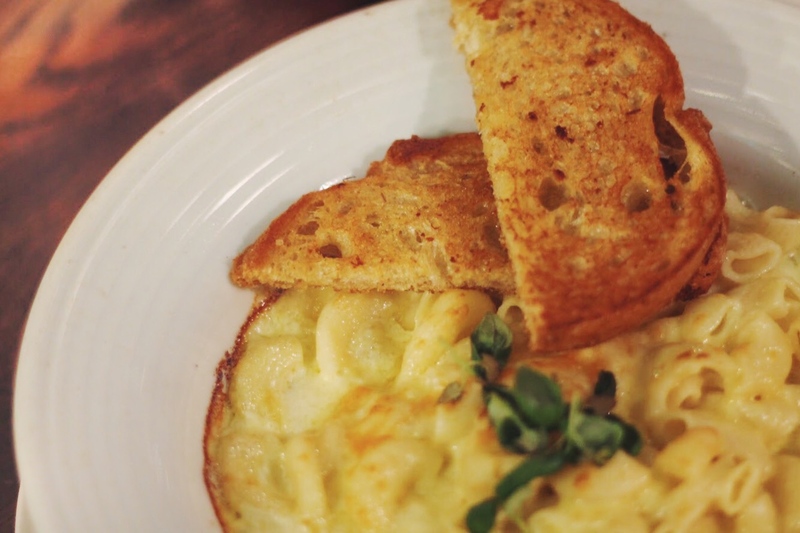 I love Mac n Cheese, so I need to head and try this!